Graduate of Lucca’s Instituto Musicale L. Boccherini, Valentina Ciardelli earned her master’s degree at the Royal College of Music in 2016. A frequent prizewinner, she played in the 2015–16 London Symphony Orchestra String Experience Scheme, and her vibraphone/bass duo, The Untouchables, performed at Germany’s 2017 Zappanale Festival. 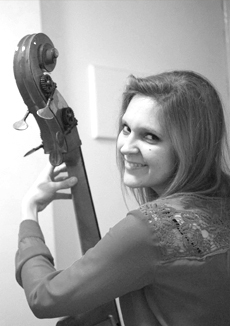 She has played principal bass for various orchestras, won a scholarship at London’s Trinity Laban Conservatoire and another from Lucca’s Animando association for her soon-to-be-published research on the music of Puccini’s ancestors, and receives support from Talent Unlimited.